The Halloween costumes have been put away, Bonfire Night has been and gone, which can mean only one thing. Christmas is around the corner. It won’t be long until the likes of Slade, Mariah Carey and Bing Crosby dominate the airwaves; the Coca-Cola lorry will be doing the rounds (although not in Cumbria); and we won’t be able to watch anything on TV without seeing the John Lewis advert. But closer to home – well, closer to LARS’ home – many of us can look forward to a festive season flavoured with a hint of nostalgia, as the centre of Lancaster is transformed into a truly magical Winter Wonderland. From 24 November to 6 January, Dalton Square, in the heart of Lancaster, will become home to a pop-up ice rink and a Christmas Market, bringing a warm, festive feeling to these cold winter months. This is the first time in the City’s history that this unique wonderland experience has taken place, but one which the organisers hope is here to stay. 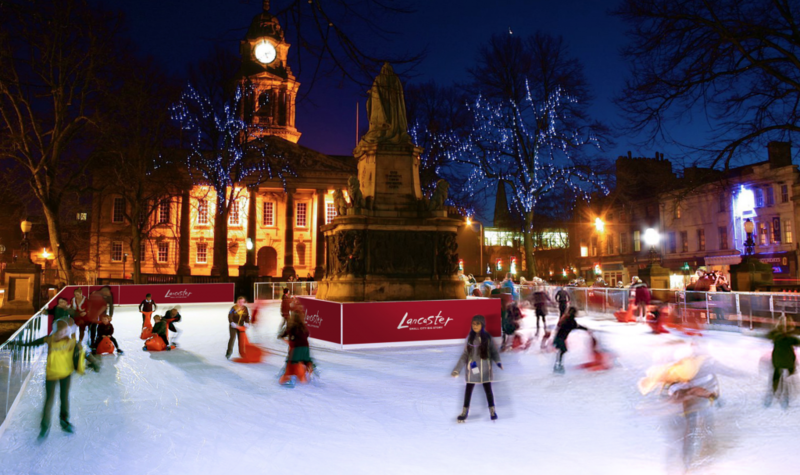 For six weeks, Dalton Square will look like it’s never looked before, as Lancaster on Ice, working with local primary schools and children’s organisations, seeks to offer an idyllic Christmas experience, providing children with the opportunity to enjoy the wonders of the rink. It’s anticipated that over 30,000 people will skate over the course of the six weeks, and over 100,000 visitors are expected to this historic city. We’ll certainly be heading to Dalton Square. What a great opportunity to work off those excess mince pies and mulled wines. We hope to see you there. As part of the event, Lancaster on Ice will be partnering with three local charities and we are thrilled that two of the charities are our chosen charities for 2018. St. John’s Hospice, which provides invaluable care twenty-four hours a day, 365 days a year, is the headline charity partner, with all profits from Monday evening skating being donated to this wonderful cause. From 6.00 – 10.00 pm every Monday, you can have a fantastic evening of skating, knowing that all ticket profit will go back to the hospice. Of course, if you can’t make it down on a Monday, you can make donation to St. John’s Hospice at the checkout. Unique Kidz and Co is hosting two skating sessions for children and young adults with disabilities, meaning they can enjoy the ice with their families. On Tuesday 27 November the rink will be have restricted numbers, perfect for anyone who needs extra space and time. There will also be a ‘More the Merrier’ disability-friendly skating session on Tuesday 4 December, where the ice will be accessible for wheelchair users. Skating aids will also be made available for anyone who needs them.